The human body is host to 100 trillion microorganisms, ten times the number of cells in the human body, and these microbes contain 300 times the number of DNA genes that our human DNA does. The microbial component of our "superorganism" is comprised of hundreds of species with immense biodiversity. To put a more personal face on the "patient of the future," I have been collecting massive amounts of data from my own body over the last seven years, which reveals detailed examples of the episodic evolution of this coupled immune-microbial system. An elaborate software pipeline, running on high performance computers, reveals the details of the microbial ecology and its genetic components, in health as well as in disease. Not only can we compare a person with a disease to a healthy population, but we can also follow the dynamics of the diseased patient. We can look forward to revolutionary changes in medical practice over the next decade. Larry Smarr is the founding director of the California Institute for Telecommunications and Information Technology (Calit2), a partnership of UC San Diego and UC Irvine, and holds the Harry E. Gruber professorship in the department of Computer Science and Engineering (CSE) of UCSD's Jacobs School of Engineering. 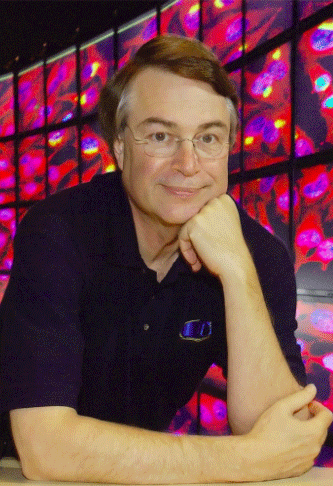 At Calit2, Larry has continued to drive major developments in information infrastructure—including the Internet, the web, scientific visualization, virtual reality, and global telepresence—begun during his previous 15 years as founding director of the National Center for Supercomputing Applications. His views have been quoted in Science, Nature, The New York Times, The Wall Street Journal, Time, Newsweek, Wired, Fortune, Business Week, Atlantic magazine, Xconomy, as well as a number of international venues. Larry is co-principal investigator of the NSF-funded PRISM@UCSD optical fiber Big Data Freeway project. He serves on the Scientific Advisory Board of MDRevolution, and on the Future in Review advisory board. He is a member of the National Academy of Engineering, as well as a fellow of the American Physical Society and the American Academy of Arts and Sciences. In 2006, he received the IEEE Computer Society's Tsutomu Kanai Award for his lifetime achievements in distributed computing systems. Larry was a member of President Clinton's Information Technology Advisory Committee. He served on the NASA Advisory Council to four NASA administrators, was chair of the NSF Advisory Committee on Cyberinfrastructure for the last three years, and for eight years he was a member of the NIH Advisory Committee to the NIH director, serving three directors.Larry received his PhD from the University of Texas at Austin in 1975 and was a Harvard University Junior Fellow 1976-79.